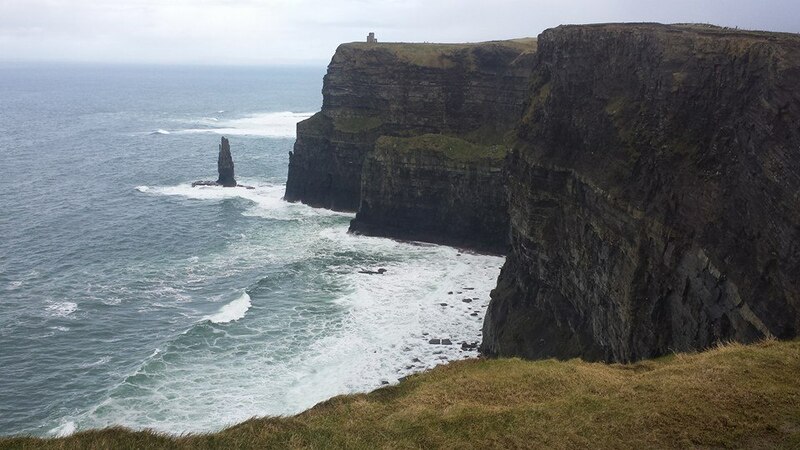 Last week I got to visit the Cliffs of Moher on the west coast of Ireland and they were beautiful. However, I once again found myself in situation where American tennis shoes were not the proper footwear for the trek I had to make. The path up to the top/edge of the cliffs was near vertical and muddy. Key word: muddy. So there I was standing at the bottom of the hill, looking up the hill (nature’s slip and slide) and back down at my shoes. A friend of mine had already made the trek up and my other friend had decided to walk back due to the rain. Oh yeah, it was raining. I started to follow him, but then I remember actually saying “YOLO” and turning around back to the hill. I took my beanie off before the wind stole it and I began to take the journey to the top. I traveled up that hill the only way you can: one step at a time. One foot after the other. The other 95% of the day I could walk without consciously thinking of each step. I could run, skip, jog on the solid cement. On that hill though, I had to slowly step to avoid falling and that’s okay. Each step I took was a success in my book because each step was a struggle. It made me think of the grieving process. When you’re grieving, struggling, you need to adjust how you measure success. Your to-do list will look different when you’re going through crap and that is okay. When it’s a rough day, be easy on yourself. You can’t sprint up a muddy hill, that’s dangerous. So take it easy. Take a shower, do laundry, write in your journal. Don’t worry about the rest of the day, just focus on doing one thing at a time. If you need to lay in your bed for an hour or so, do it. But don’t lay in your bed all day, at night you’ll look back and kick yourself for just laying in bed all day. So get up, and do one thing whether it’s laundry or cooking a meal or reading a chapter of a book. Then when that is done, figure out what to do next. Remember the only way to get through something, is to get through it. One step, one day at a time. One day the rain, hail, sleet will stop and you might still be traveling up the hill, but the ground will feel less shaky and you’ll gain enough confidence to take bigger steps. Breathe. When the wind is blowing so fast you feel like you’re suffocating, don’t panic. Breathe. In and out. In and out. Pay close attention to how you are talking to yourself. Are you building yourself up or tearing yourself down? Be corny and celebrate the little stuff! Glance back and see how far you’ve come. Don’t try and walk backwards up the hill though. Don’t become fixated on where you were. Glance back and keep going. Don’t compare your journey to anyone else’s. They started at different times, they have different shoes on, they might have climbed a hill a million times before. You do you. In life we don’t know when the storm is going to end, or when we are “at the top of the hill” or if the top of the hill even exists. And that’s the tough part about it all. It’s easy to lose hope and to feel like we’re suffering for no reason. Every hill you climb, every crappy situation you go through will build your endurance. You’ll become stronger, friend. No one volunteers to climb a slippery, muddy hill. But those who are given the opportunity to do so, learn how to struggle, how to overcome, how to take it slow. They get messy, they fall down, they get back up, and when they get to the top and see the view, the horizon, they are thankful. And even though they have mud on their jeans, and their hair is a wreck due to the wind, and some slight bruises exist from the 3 minute hail storm, they are survivors. Conquerors. And so are you. I just “stumbled upon” this blog message today, after several days of the couch laying on the couch in pain and I admit some self pity. It’s been a tough couple of years emotionally since my parents passed, on top of my own chronic illness, disability and my husbands job changes. Your message today was a very helpful reminder of how to approach the mountain of life. Just one breath at a time, accomplish one task a day if that is what it is to be. Thank you.